We have a brand new behind-the-scenes video from Aladdin that further reveals Disney's upcoming remake. It's been quite the day for those who are excited, or at the very least curious, about the latest reimagining of one of Disney's animated classics. A ton of new photos and pieces of info made their way online, offering us our first look at Will Smith's Genie, which has generated a lot of attention. But that's just one piece of a very large puzzle, as this video shows us. More than anything, this video gives a true sense of scope. Aladdin looks like it's going to be a massive, colorful spectacle. The images themselves are sometimes difficult to process because they lack context. In this case, we see everything in motion and it all makes a bit more sense. Everything is grand in scale. There are also some very faithful bits fans will recognize from the animated version, such as our titular character being chased through the streets of Agrabah. In the video, Will Smith is beaming with his signature positivity and has this to say. "Aladdin is one of those perfect stories. You don't know how you know every word of the songs. You just do." While we still don't see much of him in action here, there is plenty to absorb. 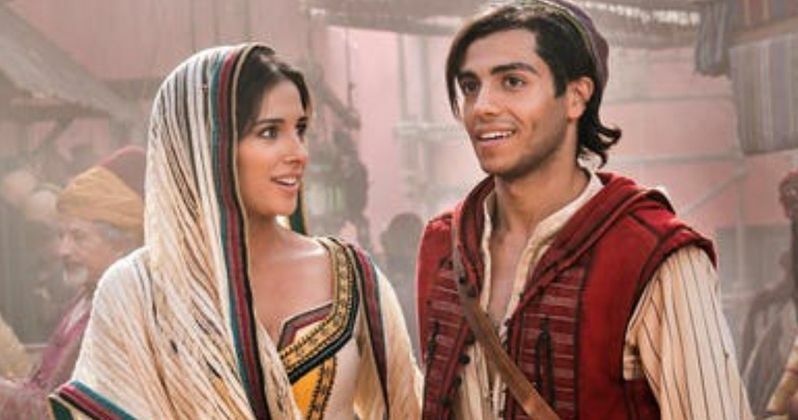 The action is largely focused on Aladdin, who is played by relative newcomer Mena Massoud, and Jasmine, played by Power Rangers star Naomi Scott. In as much as there is pressure on Will Smith to live up to what Robin Williams did as Genie in the 1992 animated version, this movie absolutely won't work unless these two main characters capture the magic. But as Massoud says in the video, they're not just trying to repeat the past. "You want to stay true to the original, but you also want to give people something different." Up to this point, Disney has had a lot of luck reinventing their animated classics for the big screen. Beauty and the Beast wound up grossing more than $1.2 billion worldwide last year to become the highest-grossing movie of 2017. Alice in Wonderland, Maleficent and Cinderella have all also done quite well for the Mouse House. Next year will be big on that front even outside of Aladdin, as Tim Burton's live-action Dumbo (March 2019) and Jon Favreau's The Lion King (July 2019) are also on deck. Though, there has been some debate over whether or not The Lion King is live-action, as it's all CGI animals, even though they may look real. But that's an entirely different story. Hopefully, this will all come together and wind up being a satisfying new take on what came before. Director Guy Ritchie's Aladdin remake is set to arrive in theaters on May 22, 2019. Be sure to check out the brand new behind the scenes video from Entertainment Weekly below.